Basalt Fiber Market studies to material made from extremely fine fibers of basalt, which is composed of the minerals plagioclase, pyroxene, and olivine. It is similar to carbon fiber and fiberglass, having better physical properties than fiberglass, but being significantly cheaper than carbon fiber. Basalt fiber industry has broad development prospects; the value is favored by investors, production companies gradually increased. Fiber manufacturer must continue to strengthen internal technological innovation, improve product quality, including the external dual role: materials suppliers and solutions providers. The degree of Basalt Fiber technological innovation directly determined the development and speed of the development of Basalt Fiber industry, and even the success or failure of basalt fiber industry. According to the statistics, basalt fiber industry is relatively concentrated. Currently, there are many producing companies in the world basalt fibe. The main players are Kamenny Vek, Technobasalt-Invest, Sudaglass, Mafic, Zaomineral, Aerospace Tuoxin, Shanxi Basalt Fiber, GMV, Jiangsu Tianlong, Tongxin, Jilin Jiuxin, Zhejiang GBF, etc. Based on the survey, the top ten manufacturers were estimated to 76.37% volume market share in 2015. Basalt fibers are made up of two components: the basalts and the wetting agent. 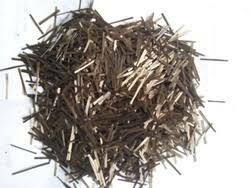 There are main types of basalt fiber: basalt chopped fiber, basalt continuous fiber, and basalt chopped fiber is about 69.10% of the global basalt fibers. Global Basalt Fiber Market is spread across 122 pages, profiling 12 top companies and supported with tables and figures. Globally, in 2015, 56.71% of basalt fiber was consumed in Road & building Construction, while 7.05% and 24.28% were respectively consumed in the automotive industry as well as military industrial. In the consumption market, the global sales value increases with the 7-8% average growth rate. China, Russia and North America are the main regions of downstream applications. In 2015, China was approximately 45.71% consumption market share. Basalt Fiber is expected to grow at roughly 7.6% over the next five years, will reach 68 million US $ in 2024, from 44 million US $ in 2019, according to a new study. This report focuses on the global market Basalt Fiber, especially in North America, Europe and Asia-Pacific, South America, Middle East and Africa. This report categorizes the market based on manufacturers, regions, type and applications. There are 15 Chapters to deeply display the Global Basalt Fiber Market. Chapter 1: Describe Basalt Fiber Introduction, product scope, market overview, market opportunities, market risk, and market driving force. Chapter 2: Analyze the top manufacturers of Basalt Fiber, with sales, revenue, and price of Basalt Fiber, in 2015 and 2017. Chapter 4: Show the global market by regions, with sales, revenue and market share of Basalt Fiber, for each region, from 2011 to 2017. Chapter 12: In Chapter Eleven Basalt Fiber market forecast, by regions, type and application, with sales and revenue, from 2017 to 2024. Chapter 13, 14 and 15: Describe Basalt Fiber sales channel, distributors, traders, dealers, appendix and data source.